PG&E’s code readiness subprogram collects data on energy efficiency measures and technologies that will support more robust advocacy in future code cycles rulemakings as well as inform voluntary energy efficiency programs. 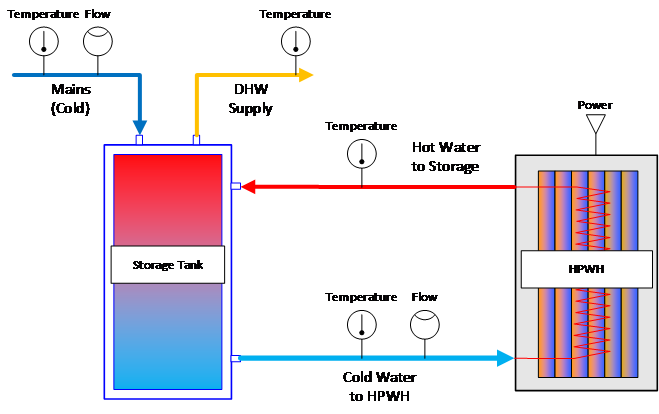 As part of a twelve-month field evaluation of an advanced all-electric Zero Net Energy demonstration home in Redding, CA, an emerging heat pump water heater (HPWH) technology was monitored in detail to record energy flows to household hot water end uses, energy contributions from the HPWH, and total electrical consumption of the unit. The monitored HWPH uses carbon dioxide (CO2) as a refrigerant as opposed to more mainstream residential HPWHs which utilize conventional refrigerants. The split system CO2 HPWH offers advantages over the conventional products in that the rated efficiency and water heating capacity is higher, the heating output is stable over a wide range of outdoor temperatures, there is no supplemental electric resistance backup heating, and the CO2 refrigerant has a global warming potential of 1 (several orders of magnitude lower than conventional refrigerants). The unit was installed in a 2,372 ft2 single-story home with the 43 gallon storage tank located in an insulated mechanical space located in the attic and the compressor unit was situated outdoors. Supply and return insulated ½” piping runs (33 feet each way) connected the outdoor thermal generator to the storage tank. Two sets of flow meters and immersion temperature sensors were installed to measure the flow and temperature difference between the storage tank and the outdoor unit and also from the storage tank to household domestic hot water end uses (the latter delivered energy term is commonly referred to as the recovery load). A dedicated power monitor recorded total unit energy consumption. Energy flows were calculated on a four-second basis during all flow events to capture transient effects with a high degree of accuracy. The nominal 1.25 ton HPWH (3.09 Uniform Energy Factor rated) was monitored from mid-July 2017 to mid-July 2018. The house was occupied by a working couple. Average hot water loads of 23.0 gallons per day (gpd) were monitored over the twelve month period. Annual water heating energy use totaled 712 kWh for the year. Annual average efficiency, expressed in terms of a non-dimensional Coefficient of Performance, was calculated at 3.04, with monthly performance varying from 2.24 to 3.42 COP. The unit operated reliably and consistently throughout the monitoring period. The CO2 HPWH is a premium, high efficiency product, and as such carries a cost premium over competing HPWH products. Mike MacFarland, the builder of the Redding house, estimates a current incremental first cost of $2,000 to $2,500 more than commonly available integrated HPWHs on the market. As part of the evaluation, a simplified economic analysis was completed based on the monitored unit’s performance and the estimated performance of a typical conventional HPWH with an assumed annual average 2.0 COP. The evaluation was completed at both the observed 23 gpd load level and at a more representative (four person household) 46 gpd level. The analysis estimated 255 kWh annual savings at 23 gpd and 497 kWh at the higher 46 gpd load level. At an assumed statewide average electric rate of $.20 per kWh, annual owner cost savings would range from $51 to $100 per year. From a simple payback perspective (with no accounting for maintenance or equipment life differences between the two product types), the CO2 unit would demonstrate a 20-40 year simple payback. An alternative calculation assessed the relative cost of adding photovoltaic (PV) capacity to offset the added consumption of the conventional HPWH relative to the CO2 unit. For the Redding climate, an additional 0.16 to 0.31 kWdc of panel would be needed to offset the 255 to 497 kWh estimated performance penalty. At current residential scale PV installed costs of $3.10 per Wdc installed, the added cost of the PV would range from $500 to $960, or roughly ¼ to ½ the incremental cost of the CO2 HPWH. Although costlier, the CO2 HPWH unit offers significant efficiency and environmental benefits (low greenhouse gas refrigerant) over existing HPWH technologies. As production volumes for the product increase, retail costs should come down. Longer term reliability of both CO2 and conventional HPWH technologies are yet to be determined and will play a role in the overall cost-effectiveness.